Marketing and other thoughts | My collected thoughts and ramblings on all things marketing. I will sprinkle in some art, and some rugby league from time to time. I hope you enjoy your visit. All views expressed here are my own. Please leave me a comment or two if you have the time, thanks. My collected thoughts and ramblings on all things marketing. I will sprinkle in some art, and some rugby league from time to time. I hope you enjoy your visit. All views expressed here are my own. Please leave me a comment or two if you have the time, thanks. The new General Data Protection Regulations (GDPR) have led most companies to review not only their marketing consents and processes, but, based not least on the veritable explosion of requests in my email inbox just before, on and indeed after, May 25th 2018, to more fundamentally consider the state and value of data as an asset. This is the real positive of the regulation in my opinion. I wonder if it may, in time, lead to a balance sheet thought around data equity in the same way as ‘Brand Equity’ was considered in the 90s as something that had a tangible and quantifiable GBP value. 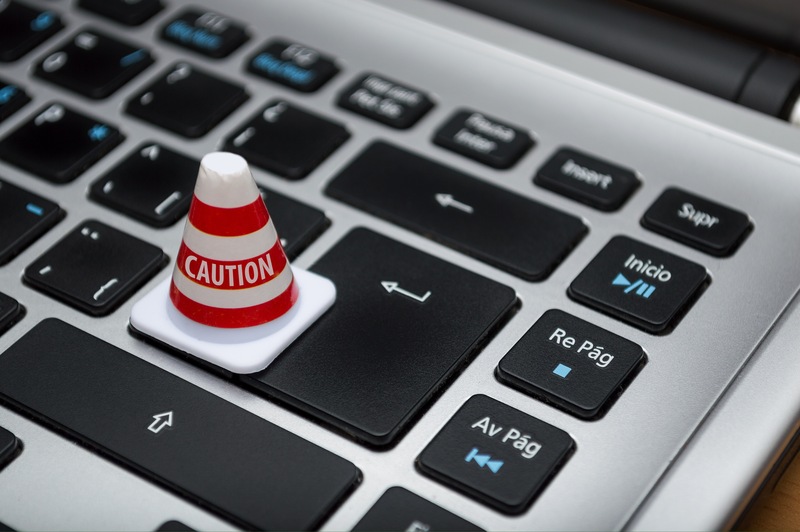 The challenge facing marketers post GDPR strikes me as being initially straightforward, but time will tell if the impact of the changes makes this more complex. In my view the single view of a customer (SCV) is becoming paramount in ensuring the valuable asset that is personal data, works for the benefit of the business concerned post GDPR, and does not adversely jar with customers. It is trying to create the dreaded ‘win win’ scenario in a landscape where the value paradigm has shifted significantly, and that is never an easy balance to strike. 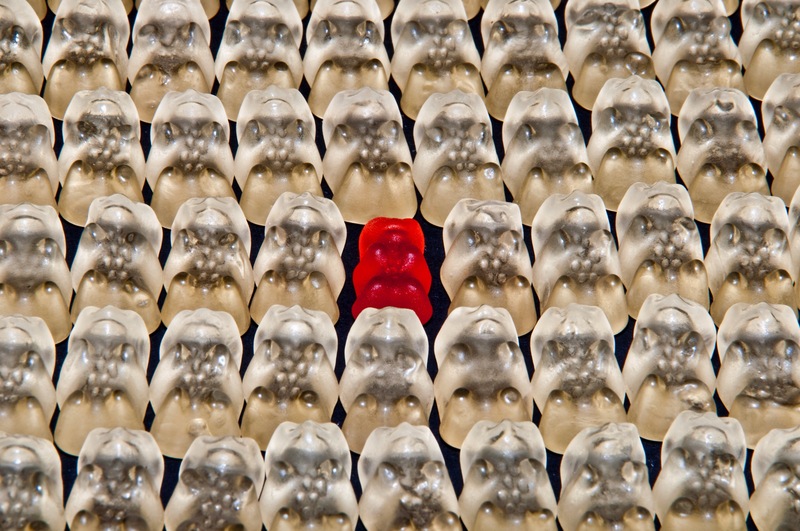 – a ‘knowing’ personalisation level is possible and can be expressed in communication which the business can attach a value to (relating to relationship or sales and so on). The key word here for me is knowing. The SCV should demonstrate the company knows the customer in a positive and unobtrusive manner. GDPR empowers the customer to manage their relationships more proactively and transparently. The value of an individual’s data to any company is more visible and obvious post regulation to the customer. For some the value of their data may be surprise, but the volume of email and white mail will have fuelled that understanding (or at least awareness) in a way that if not acknowledged is a risk for business success. The emails, direct mail, calls and texts we have all received have created a long-term impact in changing the dynamic of the relationship, the paradigm shift is that SCV should now be read as Single Company View not single customer view: The dominant partner is now the more educated customer or prospect, one who will recognise on some level the value of their personal data. To not recognise this shift is a high risk strategy for any data led business. Customers are choosing to ‘freely’ interact with a company and this choice can be reversed easily and quickly if the company forgets the customer is dealing with a single company in that moment. If the SCV acronym we know and love as marketers is to stand, it must recognise the power shift to customers and be read as both single customer and single company view. reassure the customer or prospect by dint of action, value offered and by not overusing the data. Thinking of the data as fragile and easily damaged is more likely to be a winning formula. a fine balance to strike and however good the marketing asset the best way to monitor this is likely to be opt out rates within the campaign decay curve and customer feedback. Thinking of the data as an asset to be retained for longer term value becomes more important, cherish it! and use a control cell, this will give a quicker read on the level of personalisation that resonates and will protect the single view of the company by the customer (but make sure it is statistically significant). Post GDPR service contacts can be an opportunity to drive marketing consent, but be careful, it is possible to damage consent levels if legitimate interest is abused for the sake of a quick sale. Remembering the customer may not have freely volunteered marketing consent for a reason …making the service contacts valuable may reverse that. This mind-set change here is as important as thinking SCV is a single view of the company (in the moment) for the customer or prospect. Thinking of data like this should ensure the business considers its actions more deeply post GDPR and not lose long-term value by short termism. Remember a chipped china cup might still function but it’s value is much less than the perfect version. These thoughts are my own, and I would love to know yours, if you get chance send me a comment or two and thanks for reading. Disruption is an often used term in marketing but it is rarely seen in reality. For many, in the hurly burly of marketing communications, it remains talked about and revered, but not delivered. When it is seen it is rarely from a ‘smaller’ brand, but where budgets are bigger and the Agency voice may be more compelling and passionate it does show itself more frequently. Breaking the norm … if the world is beige then paint your comms or idea bright red, make it stand out. The aim of such disruption, for me, is always only appropriate if you have an end game that is driven by a desire for an increase or a reinforcement; disruption should not be an end in itself. Increased sales and/or revenue are the obvious objectives of disruptive activity in marketing, but consider also increased curiosity and memorability as well as overall awareness. These latter elements may be a precursor to the increases in financial returns which are your ultimate aim and can be used to reinforce the brand image or values which may be necessary in some cases. If the offer itself, be it a product or a service, is truly innovative that may itself be disruptive enough. If, however, your task is to disrupt your audience through the communication then the process of disrupting may take more time as you establish the brand credibility through communications designed for memorability and cut through. This reinforcement is required in my opinion to ‘mask’ the ‘me-tooness’ or ordinariness of the actual offer in many cases. This is a strategy with a higher risk but the advertisement I saw recently, and which prompted this post, is really interesting and I think falls into this category. It is interesting enough to drive me to post again, having been quiet for a long while on my blog. Disruptive comms? Hell yeah ! The ad is from Trade Centre UK, its disruption … silence ! The silence is incredibly disturbing, the TV going quiet in an ad break is so unusual and the result initially, and repeatedly, is to watch TV while checking it’s not on mute. The result being you watch the ad itself. The disruption is complete. This is clever, low cost, disruption and my out-take … they have good prices. Job done I expect. The paperless office was a phrase I first heard in anger when I was working at the Halifax in about 1989. Email was being rolled out to the great and the good in the business. Up to that point we were still issuing Memo’s and I fondly remember the Manilla reusable envelopes with a string and cardboard circle lock. The army of Internal Post workers did a great job of shifting paper around the business supporting the vast amount of memos generated. The internal training confidently predicted the end of paper in short order. I instantly embraced this new cutting edge technology and found myself typing memos and then attaching them to these new-fangled emails so the recipients could print them out. I did the same when I received them. I think at that point I realised the sunny upland of the paperless office may take some time to achieve. Collaboration – my team and I work remotely from each other and it’s quite hard to efficiently and effectively share pieces of paper: electronic files are much easier to ship around, update and share. In the scheme of things I know that I am only making a small dent here, I still use my Filofax classic for notes, having tried Moleskine notepads and School Exercise books in recent years (actually very good and very cheap! and a reaction to everyone else using Moleskine books). So paper has not been completely eradicated. I’m also fond of a flip chart as my team know only too well. I’m doing pretty well though. In the first 6 weeks of working at home I printed 6 pages of A3 paper on my weekly visit to Lichfield Head office. I am pretty proud of that. I have found the experience liberating and it has given me a really good feeling, this is a good thing to do; for me, my business and the environment. For example I know that I used to print emails off and read them later, but that often included pages and pages of footers, and as much as I recycled this paper securely it was still using energy for the printing, costing the business money and was often stored in drawers until a convenient reading slot opened up … sadly the email had often been updated by then, so rendering it useless, or in need of a reprint. So all in all not a very environmentally friendly activity. If reading web pages on your laptop or desktop why not save it as “Web Page, NAME” somewhere in your document folders (I created a folder called reading). You’ll get an HTML file and a folder full of images and other data contained within it don’t delete this. When you want to see the web page, just double-click on the HTML file and you should be able to see it just as it was when you saved it, whether you have a connection or not. Simples. I make notes as I go to inform any response that is needed – I use a Sticky attached to my desktop (called scribble pad) or my Filofax. Tracking changes on a document is helpful too … just add your comments and save it down as your version in the correct folder will keep your thoughts front of mind even if you don’t need to send a tracked document back. I have the advantage of a laptop… so I use it as such … I take it off the dock, sit down and read. That really helps me focus too, I wrote in my last post about the need to ‘change state’ and manage your mindset, this is another good example of how I find this can be achieved. Think about your filing – and then keep that folder clean, don’t replicate an over flowing filing cabinet – the IT team won’t thank you! I would welcome any comments on your own ‘paper’ challenges, thank you for reading. I now work from home. There I have said it. The last 6 weeks or so have been an interesting change in my working life because, after over 30 years of leaving home and going to work each morning, I now don’t, I work at home. Change is good and I embrace it, knowing what the change is helps me accelerate through the change curve at a fair pace, it is unexpected change which takes me time to get used to. This change though was planned, thought through and delivered in relatively short order, so that helped. I did what most people would do when this became a real possibility I googled the subject. More than once. I also asked around and whilst I found some information this is inevitably a subject that is intensely personal and so it’s variable and in fact what I found was not very practically informed, a lot of theory in fact. I haven’t posted on my blog in a while – apologies to avid readers – work and family have been all-consuming with new homes, new jobs and changes in my family too. All positive but they occupy the mind and the body a little. Ok, that sounds counter intuitive, but I do; my commute happens to be quite different though. In some blogs I read it recommended this and I do find it works. I choose to leave my house and go to the gym for an early morning workout. If I can’t do that for any reason, I walk out of my house and down the lane to the fields near my house. The reason? To change my mind-set and to recognise that for 30 odd years I have been doing a commute that in some way prepares me for a day’s work. I would also recommend in the same vein making sure you dress for work, maybe lose the tie, but you are at work after all. This is not quite as simple as it sounds. My study at home is now my place of work. My wife and I agreed not to refer to it as my ‘Office’ as this is a shared space. We still have our own iMac etc on the desk next to me. This is where my wife and I edit photo’s use the web and so on. Thus, I have to keep my ‘work’ element neat and tidy and organised and, crucially, separate. It is important I follow the same clear desk policy at home as I did in the office. This both helps security and keeps work life running smoothly alongside home life. I did buy a larger desk and that has worked a treat in fact as I chose a bench style deliberately i.e. no drawers to fill to over flowing! This was out of my control to a certain extent, but I had great support from my company. I used two screens in the office and have a powerful laptop but, and bearing in mind my tip above, I don’t have room for that at home, nor would I want to fill my home with work equipment. The solution for me in my role, and thinking about using the design software we use, is a slightly larger screen and having a clear enough desk to use the laptop screen as an email view alongside it if I need to. The use of a Bluetooth headset with our Skype for Business solution adds kit to my desk and uses another plug socket, so I use a simple USB headset now. My team and I have also chosen to embrace a paperless strategy, more on that in my next post, so no printer – another reason the 24 inch screen has been a tremendous choice. Collaboration software, to support team working, is next on my list to crack. In the same vein challenge the status quo, see what can help you. At the most simple level what I am trying to say is: treat remote working as an opportunity to use the best of what you have. Try and use video rather than just audio calling and definitely try not to hide behind email. That’s a very easy trap to fall into and if you are used to working at home every now and again it is often to complete a specific piece of work, meaning the phone may be turned off and email checked infrequently. This is different, guard against being an email warrior! When working at home you are likely to have many fewer interruptions so it’s easy to respond instantly to emails, but it will break your efficiency. In fact it is one reason I like the single big screen and I’m not currently double screening my email, as I used to in the office, to help me manage this. I am looking at how I might use chat rooms in Skype or SharePoint to help collaboration. 05. Move about a bit! Big Brother is not watching you! One of the helpful things about our software choice of ‘Skype for Business’ is that it shows your availability. It also shows if you are ‘INACTIVE’! This is my equivalent of the ‘big red button’. Finagle’s Law means every time I nip to the kitchen to make a coffee or go for a 5 minute break … I know my phone will ring, I know my boss will email me and he will see I’m inactive having checked my diary, he will think I am bunking off watching the TV. Clearly none of these things is actually happening but I think it is. This is a factor of working alone and in isolation and is a perfectly human reaction. My only advice is to recognise it, and try to manage it and, well … try not to be paranoid. My team and I have talked about this in our weekly team meetings. I will address managing a remote team in a future post, but in the meantime we have agreed a simple but effective solution; diary notes. Ok it’s not that elegant but it does work. I simply add to my diary what I am doing if I think it’s going to be helpful to others e.g. if I’m taking an early lunch to nip to the local shop I diarise it, If I’m going to be writing a paper, I put it into my diary as an appointment, and I have an open diary. See, I said it was simple. Even if you have worked at home intermittently, don’t expect this to be the same, it is not, it requires a mind-set change just as much as a physical change. It can be lonely undoubtedly and for a creative role like mine the lack of conversation / someone to bounce ideas about with is hard. My advice is to simply be open and talk about how it feels not just with your boss but with colleagues, try not to bore them though! My post on team working will look at this in more detail. So those are my tips, I hope they help you or are at the very least of interest, you’ve got this far after all! The obvious question you, my reader, may be left with is simply: am I enjoying it? Honestly, I’m not sure, I do know it’s harder than I thought and I am having to change how I work more basically than I expected, I need to set more short-term goals I find and work in short 30 minute bursts, but overall it’s been a good experience so far. I am indebted to one of my colleagues who gave me some sage advice having been a home worker himself by the way, a reminder that in the words of the late Bob Hoskins “It’s good to talk”. If you have a few moments please share your thoughts on my post. Thanks. PS here’s my space – see I told you it was neat! On vacation in Cambria, California, last month I came across a lovely example of branding in action. One that I think so exemplifies certain areas of brand success and risk that it’s worth thinking about in some detail. 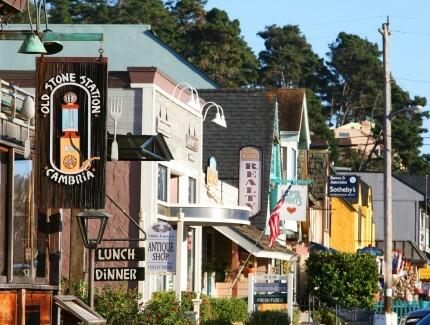 Cambria is a lovely little seaside town in San Luis Osiba County in California, USA. It’s population is c6,000 but that is swelled somewhat during the summer season each year as surfers and ‘west coast road trippers’ use it as a stopping off point. 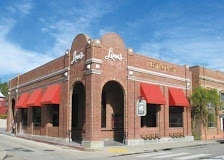 It’s location next to William Randolph Hearst’s castle and Moonstone beach make it a great place to overnight. Branding means many things to Marketers it has categories such as sub-brands, brand extensions, product as brand and so on. It is however, most Marketers believe, much more than mere communications and messages. It is an end to end experience of a company or in some cases of a product. For an example of the latter, think product as brand like Hoover or Google. Town ownership or control by a family is somewhat more common than you think. In the UK we have Bournville the West Midlands town created by Cadbury’s for its workers and Port Sunlight on Merseyside, created by Lever Brothers. In the USA it is most common in agricultural or industrial towns. Wilson in Arkansas is one example – owned for 125 years by the Wilson family and run for years by Boss Lee (I’d like to apologise to his family if you now have an image of Boss Hogg from the Dukes of Hazard in your mind … I know I do). Interestingly it shares a common, strange, architectural preference for mock Tudor buildings with Cambria. Oregon State University is in Corvallis, Oregon and has an enrolment that dwarves the population of Cambria at c27000+. It has a tradition grounded in agriculture and in developing sports stars – NBA, MLB and NFL especially. Significantly for this post it has extensive and significant levels of research funding. 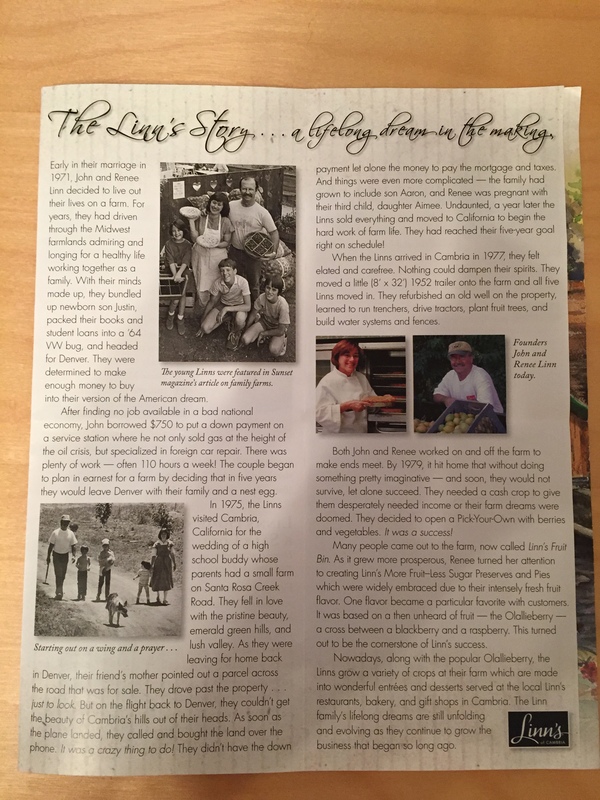 Ok, so those four pieces of background information, seemingly disconnected are a simple set up to a story of The Linn family and Olallieberries in Cambria and their brand and the brand experience. I found it fascinating and I hope you do … It’s a tale of innovation, branding and marketing with lessons aplenty. I am indebted to the Linn family for providing the following background to their story and how they have developed Cambria, their brand and their brand experience. I will summarise the story but you can find more information here. In the early 1970s John and Renee Linn determined that they wanted to be farmers. It took a lot of hard work and planning to create the reality In 1977. The intervening period involved buying a gas station, finding a plot of land in Cambria during a visit for a friend’s wedding and stretching their finances to the limit. Their 5 year plan was coming together. Farming is a tricky business and despite all of their graft and commitment, by 1979 things were becoming a little ‘sketchy’ as Californians are wont to say. The turning point was turning the farm into a ‘pick your own’ concern, both vegetables and soft fruits. It was the latter that kick started the dynasty they have now created. At this point you know why I talked about Cambria. To the University of Oregon now; in 1949 the University, funded by the US Dept of Agriculture developed the Olallieberry They are a cross of a Loganberry and a Youngberry, in essence 2/3rd blackberry and 1/3rd raspberry. The Linn family farm specialised in this crop, it took an innovation and turned it into a commercial success for them. It was, and still is, a rarity, so the competitive advantage and brand experience is fairly unique. It provided them with brand differentiation and a USP. Now you know why I talked about the University of Oregon. 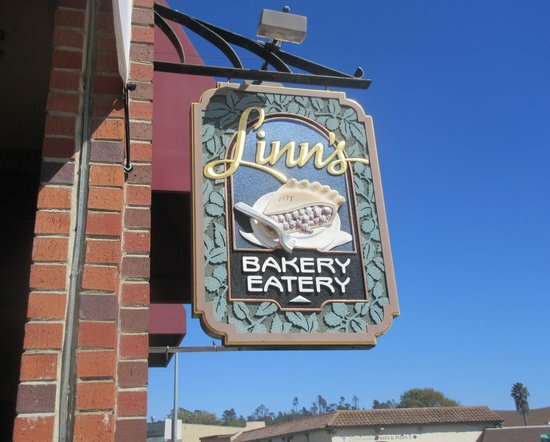 The Linn family has a heavy presence in Cambria – it has a Olallieberry monopoly and four distinct businesses – a cafe, a homewares store, a restaurant, and a gourmet foods business as well as their farm and farm shop. So a little way off town ownership but they are on their way I would contend. Now you know why I drew your attention to family owned towns. So, to the brand lessons themselves. It is clear that the choice of Olallieberry gives the family a clear and almost unique advantage. The soft fruit is still rare and it lends itself to multiple uses as well as supporting the core PYO business. This will allow pricing advantage and the development of a cult following; gold dust in engagement terms. From the simple fruit comes jams, and other foodstuffs, the fruit pie is truly outstanding by the way, I have first hand experience. The opportunity to build out into the deli and into gifts is natural and the restaurant is a clever way of offering Olallieberry gifts alongside fine dining. This increases the value engineering off a simple soft fruit crop. It also allows a degree of balance that smoothes the cropping season challenges (in income terms) across the year. The brand dominates the town, it feeds off Cambria and Cambria feeds off it. The multiple family outlets, and the brand extension work to ensure the Linn family and the Olallieberry are synonymous with each other, interchangeable almost. Brands that are borne of publicity and word of mouth last longer and are generally more successful – as well as being very cost-effective in revenue to advertising cost terms. The publicity courted by the family on TV and entering it for accolades was a wise move. It has allowed a supportive tribal following and enabled the brand to extend further by selling branded goods through other stores in wider California. The Food Network TV channel has been a rich seam, well mined. The whole operation is driven by authenticity and the family connection and heritage story play well alongside the publicity to make this a very authentic brand. The understated packaging and shop fittings as well as the restaurant decor suit the town of Cambria and are not too modern or over designed, so they fit well with the brand rather than jar. There is a feeling of homespun authenticity that works really well. I hope you found this post interesting, the brand, the product, the experience itself is an interesting one due to its uniqueness of offer, its clear sacred words and icons and it is a brand that ticks many boxes that a good brand marketer would strive to achieve. I suspect that the Linn family know exactly what they are doing but may not have expressed it quite as I have here. I have mixed and matched brand theories from the 22 Immutable Laws of Branding, Primal Branding, the Philosophy of Branding, and others, and I have tried, like Plato, to look below the surface of this brand. 3. 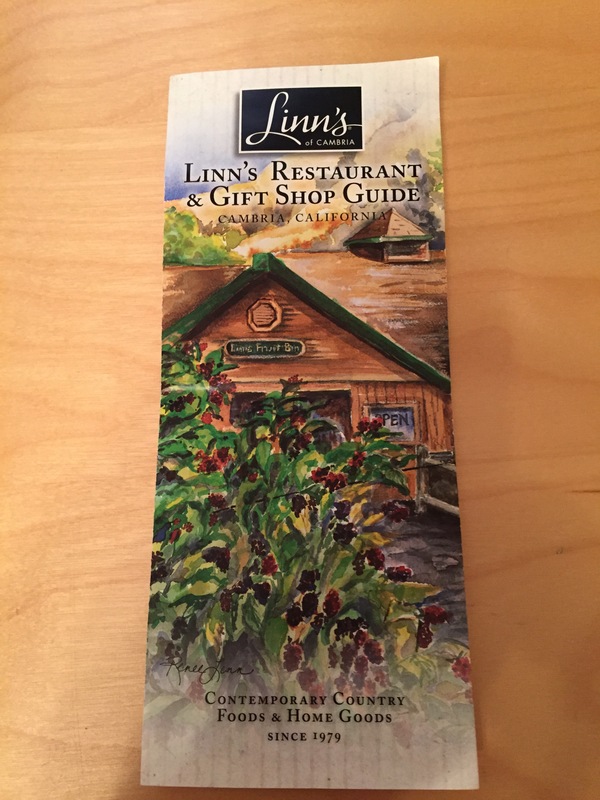 Avoid the pre-starter in the Linn Family restaurant! I’m used to bread and butter before my starter but this was bread and jam !! A brand extension too far in my view !! There has been much written about the UKs ageing population. I am indebted to the Royal Geographical Society for this link. Please check it out. In short, it summaries the challenges we face as the number of over 65s grows in volume, and over indexes as a percentage of the population as the birth rate drops. I will not recreate all of that story here, please click the above link, it is a simple 60 second read on the 21st Century challenge of an ageing population. It explains it far better than I can. So why post if I think someone has already written so well on the topic? Well, I have seen a response, and I like it ! It is so simple in fact, I am going to leave it to you to read the poster, rather than explain it. It is available in my local convenience store, which sort of makes sense … as an ageing population drives less, the convenience store market will undoubtedly grow. The nice thing for me is that it is a response from a smaller business. I have yet to see similar tests from the bIg supermarkets. The whole business is less than 200 stores and whilst you would expect this sort of member focused activity from a Co-op it still really demonstrates that they know their customers – there is no point adding these in a city centre store with footfall with an average age of under 25! I work for a smaller business and one thing that I have noticed is that I have a more detailed understanding of what makes our members tick, you feel closer, you don’t rely on the big omnibus surveys and full-blown presentations. 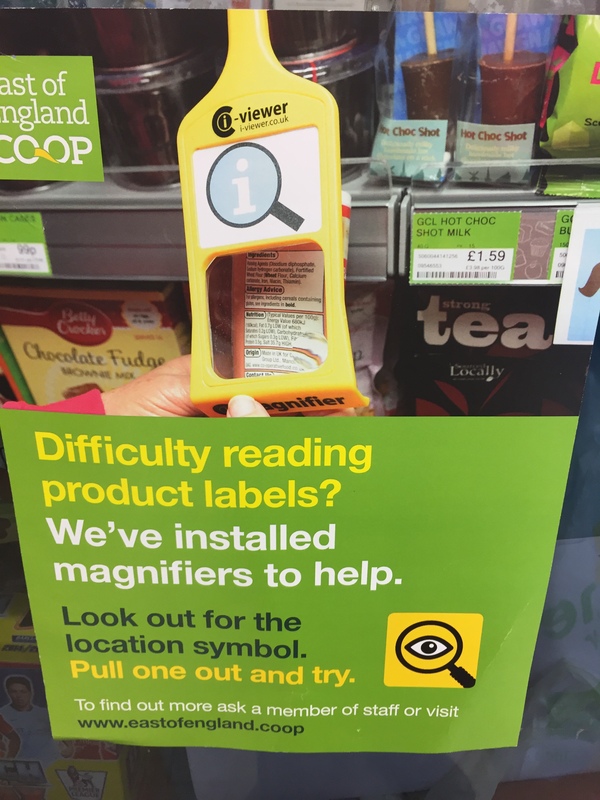 You are inherently closer to your customers, and, if you have support from your Exec to test and learn, as I do, and like East of England Co-op clearly do, then it makes sense to try new things. This is a great response, I for one hope it works well for them. I am a magazine subscriber. I look forward to the magazines dropping through my letterbox on a monthly basis. I notice when they do not arrive, I fret when they are late, and in one case, where the publication is intermittent I check back for updates. This may appear a little old-fashioned, but to me it makes perfect sense, the tactile nature of a magazine in print makes it more than mere content. Being a Digital Marketer these days I read the online versions and I use Flipboard and other apps to feed me news, but in some cases a physical magazine is just what is needed. I Have an emotional engagement that is not just about content with magazines. 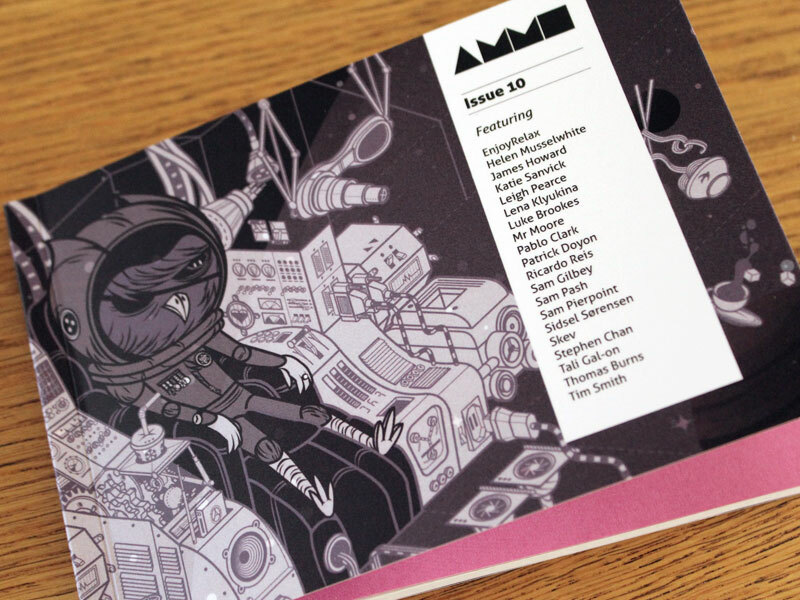 A question you may have in your minds is: why on earth is Paul rattling on about magazines? A fair point. I recently gave some of my collection away; As regular readers of my blog will know I have many passions in my life, my family, Rugby League (my beloved Workington Town RLFC) and art. Art has been a long-time passion and interest, I love learning about art just as much as I do looking at it. Splitting time between my two homes meant it was sensible to rationalise my collection. I gave away my Tate, Contemporary, and Modern Painters magazines, carefully curated over the last 15 years. This was a positive decision I donated them to my local college, South Staffs College in Lichfield, as a resource for their Arts Students and they were very grateful – I hope the students have found them helpful. 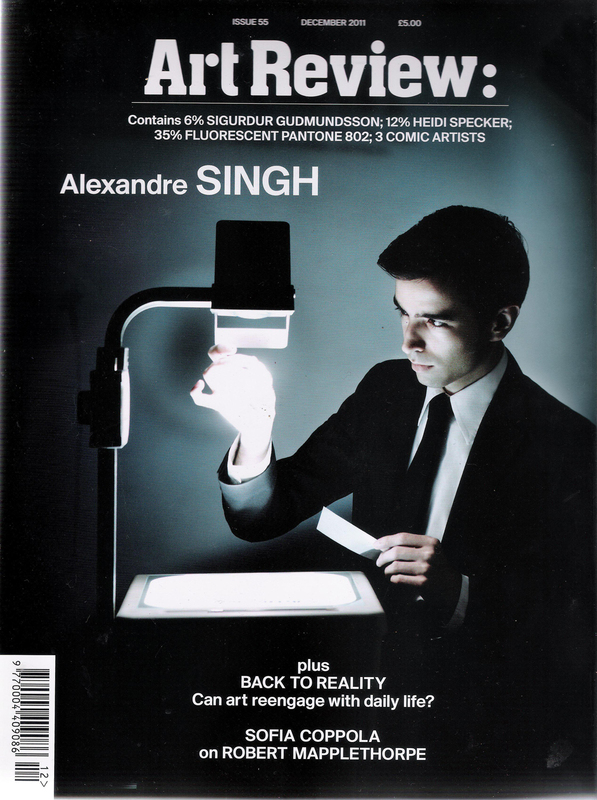 I have hung on to my Art Review magazine collection though, its was too much to give that away – it’s nearly 20 years of my life ! So when my latest issue of Tate magazine arrived at the weekend I rediscovered the joy of receiving a new magazine, topical, beautifully printed as all art magazines are … it reminded me of the power of print. My kindle and iPad are awesome tools, but a mug of coffee and magazine with soothing jazz on in the background really eases away the stress and strains of a busy day. I think I need to remember this in my day job, we are about to embark upon an intense period of press advertising, largely in magazines, so the care and craft we need to put into these ads should reflect how people feel about a magazine that occupies a place in their home. I think that is a crucial point, a magazine lives in many rooms, its eminently transportable and Magazine publishers who are successful do, I believe, recognise that privileged position. Thinking about what I have written rationally for a moment, I have allowed those magazines to live on in my home, and so the advertising within them, for many years… now that is some decay curve ! I might be a modern Digital Marketer, I might take my kindle on holidays instead of a book, but I will continue to subscribe to magazines ! It is interesting that magazine circulation stats are now amalgamated; Digital and Print. I hope that means that print’s stock rises again, it has never waned for me. Butlin’s is, I think it’s fair to say, unfashionable. Big Data on the other hand is very fashionable. Co-creation is oft talked about by Marketers but still rarely seen. These three unrelated truisms sprang to mind when I wrote my last post in this blog, but the reason is worthy of this separate post. Channeling Woodstock may not be very common terminology but in creating the forum “Mumstock” both Mumsnet and Marketing Week have developed an interesting concept to try and offer insight into how ‘Mums’ (apologies for the generalisation) respond to advertising and to try and distill insight into what makes a connection with them; a group of interested parties, just like the like-minded hippies that flocked to Woodstock in 1969. Only 1 in 5 Mums relate to the portrayal of Mums or motherhood in advertising. Given the revenue potential of that target group that means a whole lot of advertising is missing the mark completely. The Co-op Food business were keynote speakers at the event and unfashionably they picked a core headline grabbing insight themselves : Look beyond Big Data and create an emotional connection for your brand. Ok, the second bit is not rocket science, but the first bit is definitely anti trend ! Definitely an unfashionable sentiment for a Marketer in 2015. Google.co.uk returns about 800 million results for Big Data, IBM and Xerox dominate the Paid ads which gives a sense of the investment in analytics and its value engineering potential. So why did I mention Butlin’s? Well they have created a new suite of chalets at their MInehead, Somerset, UK holiday camp and their insight … well it was from Mumsnet. They consulted the Mumsnet community – a notoriously vocal community – and asked them how they should design their chalets to appeal to a family audience, by default identifying their target decision maker is, in most cases, the Mum. Crucially this demonstrates they have listened. A bold move, but one that is well thought out. Marketers rattle on about co-creation, and I don’t know how deep the research went, but its clear in the reality that they have listened; to questions about how many TVs to have in each chalet, what the exterior should look like, arts and crafts supplies for rainy days and so on. The ad doesn’t mention the link with Mumsnet, but you can see the GBP 16m investment has radically changed the appearance and facilities. They appear to have listened to the research from Mumsnet that says that Mums see their motherhood as a relationship not a job … and by default I interpret this as meaning for Marketers that the emotional can clearly override the rational. Billy Butlin’s empire was founded in the 1930s but in 2015 his vision/mission statement “Our true intent is all for your delight” seems well suited to this collaboration. Butlin’s refer to this development as a return to what made them popular, so it may be that if I post again in 12 months time my ‘unfashionable headline’ will need a change! Advertising trends come and go over time, but one trend, certainly in TV advertising terms, seems to be sticking around and in some cases becoming quite brave. Creative agencies may call it real life, and for a different generation this is a 21st Century version of kitchen sink melodrama. It’s more complex than it sounds, I mean it feels obvious doesn’t it, that if you reflect real life then it shows your brand as empathetic, but that’s a hard trick to pull off in broadcast media. It has to be ‘average’ enough to not polarize I imagine. “Fred about the house” is the ad title and it is indeed a slice of just that. There is no first person commentary here, and that style is evident again in this list. Other factors that make this work: The actors are all attractively engaging and not too perfect, the humour works; it’s wry and gentle and just racy enough. Bringing back Fred as a real life hero seems not to jar (sorry I could resist the pun). Nice ad. As you know I have a fondness for the Co-op having worked on the brand (still no heritage story play by the way !) “Here for you for life” never really resonated for me but this ad really does. It’s entitled ‘Easter made easy’ and that plays nicely into the local co-op positioning for last-minute, low basket value, shopping. As in many of these Lifestyle ads the hero’s are children and good they are in this ad. The nice thing for me about the ad though is the normal housing, this is clearly not ‘Waitrose-land’ and the ad works better for it. This is a beautifully shot short film in my view, I forget it’s an advert, the production values are so very high. It uses the diversity of families in 2015 to make a point about there being a movie for everyone. Its brave and smart and knowing and the art direction is beautiful. And I don’t even subscribe to Sky anymore ! A love story in 30 seconds. The Troggs soundtrack rocks this ad along, but what makes it work is the ‘average girl/boy next door’ looks, the normalcy of the setting: Office life, lunch in the sun, boy meets girl, rain, romance. A truly lovely little ad in a category that needs a little inspiration to go beyond the ‘burger as superhero’ fodder that usually airs on our TVs and cinema screens. By now you will have noticed the filming techniques common in this genre: not too sharp, feathered photography, panning shots from a relatively static camera and no ostentatious glamour. This really is a very nice ad. Can KFC better that ad, you bet they can, this is a love story in a minute, and of a different kind. This is brave ad. It could tip into mawkishness very easily but because it’s portrayed as a normal slice of life, of growing up, it doesn’t. The normal house, the normal bedroom, the light pastel colours, then the music picks up pace as the boy grows … and conversation in the background – no talking to the audience. Lovely work. It has attracted degree of cynicism, but as an ad it says more about how the brand wants to you to feel than any number of ads that are making a hero of the KFC product itself. Ok this is niche, but it is a brilliant little slice of family life. I like it because it is unexpected. it’s an ad funded by a drug company but has at its heart a desire to educate. To do that and break through in a noisy marketplace it needs to resonate. Whatever the reality of pet ownership is, this ad portrays it as we would like it to be. The family is engaged, attractive and interested in each other and the dog. The filming is atmospheric, pastel shades and sunny. The end frames are therefore very effective, as the delivery of the final message hits home hard. I like this ad a lot. Used to relaunch the brand this is a very brave ad in my view. It relies solely on making the frozen food look natural as the hero. The family are present and you can hear them in a good strong funny voiceover, but the ad gives the main voice to the food. It’s realistic whilst being unrealistic at the same time. That said the delivery of “no” is genuinely funny at 26s in. The accents are important in the delivery too. Nicely cast and nicely imagined. Brave form Birds Eye I think. I have used the word brave a few times in this post. This ad is the bravest though. It is so easy to get this wrong. Coleman’s have pulled this family melodrama off really well in my view. Have a watch and see for yourself. I think it’s great that brands and Ad Agencies are now accepting that families in the UK are very different form the cosy Oxo family ideal of Mum dad and 2 children. Excellent work Coleman’s and this builds on the excellent Shepherds pie ad from 2014. In itself that was a step outside the category norm as you can see. Well this is my family life ! The Generation Game has returned, the cuddly toy is back ! Marketers are often accused of copying other great ideas, but I am somewhat surprised, to put it mildly, that in the age of the Internet of Things, given advances in personal computing and mobile telephony changing our buying habits, and in the age of multi-screening omni channel digital solutions that, giving away cuddly toys is THE great marketing idea of 2015! I excuse from this criticism the Meerkats, that is a customer journey par excellence, I, in fact, own two Meerkats myself. That whole concept and execution from Compare the Market is clearly wonderful from the ‘wacky’ delivery updates that really engage – but serve the purpose of filling the 3 month qualifying void to minimise calls – to the way it now is the brand itself. It is interesting that Compare the Market have stopped the TV ads that were based on their brand name and have extended the Meerkat experience into the new Orange Wednesdays. 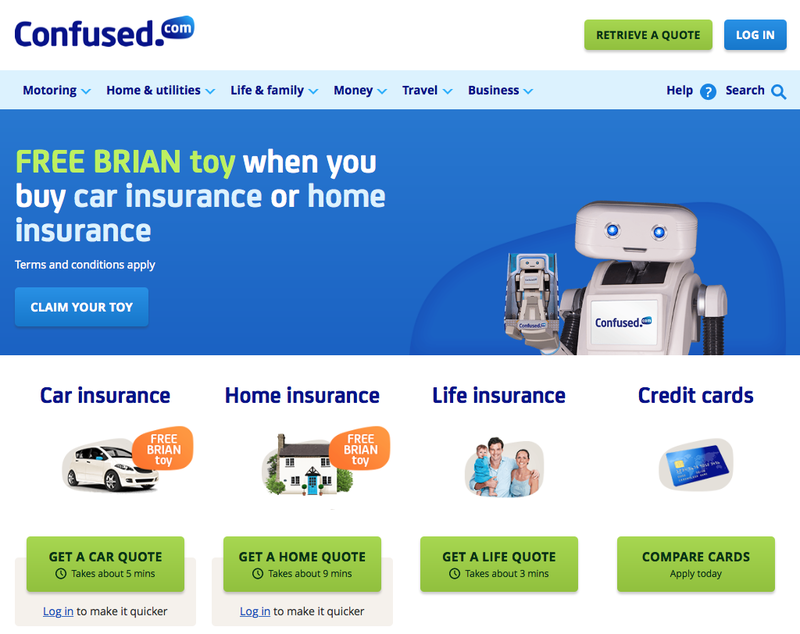 It is perhaps obvious that Confused, the aggregator suffering most due to some great ads from Meerkat and Go Compare, have attempted a similar tactic – but is giving away a Brian robot toy enough? it’s not very warm and cuddly, unless you are a big Short Circuit fan. The recent advertising more than heavily features the robot as the hero, leaving the price saving message as a secondary, clearly this must be a planned strategy and it does mirror the Meerkat strategy to an extent. The Facebook page is strangely lacking in emotional resonance but does make some play of the 80s retro styling of Brian. 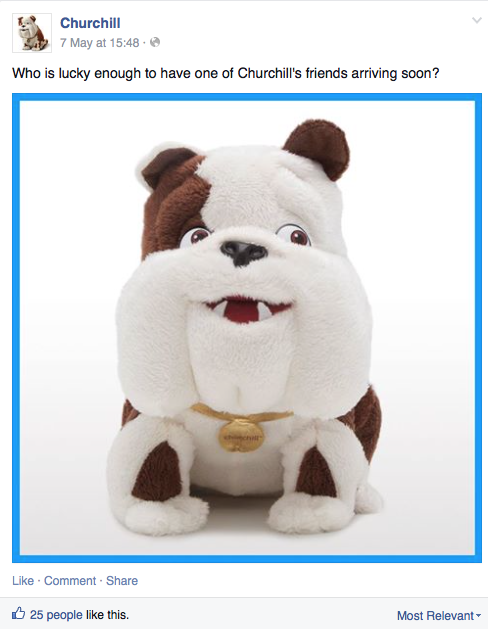 So in the spirit of imitation Churchill Insurance is now giving away a cuddly version of Churchill. 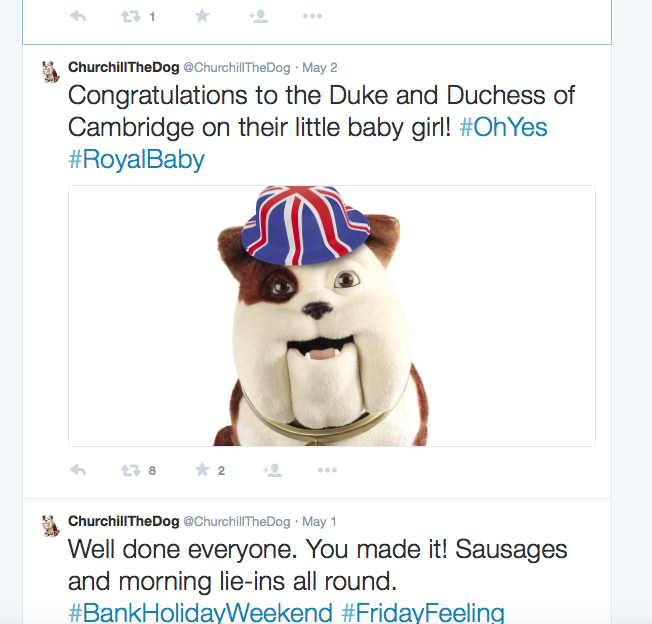 It makes a heavy play on the website but is less prominent on Facebook but the twitter account @churchillthedog makes good use of the offer using topicality and the offer itself to engage followers. Listening to the radio this weekend it is also central to the radio ads for the brand. I used to work on the Churchill brand in the 90’s and we always used to have the nodding dog available, but in its new guise it is much more engaging. The idea of “Challenge Churchill” is still at the heart of brand though, so its less remote/disconnected than Brian, for Confused, in my view. So apart from Insurance is there any other evidence … well yes, in the unlikely guise of Sofa Works and Neil their cuddly sloth. Ubiquitous due to Gogglebox bumpers and idents, it’s a natural step I think, and it is clearly a nice added value giveaway that is not designed as a convincer – a GBP 10 toy off a GBP 150 car insurance policy is pertinent – a soft toy on a GBP 500 sofa? well it’s a nice gift and one that engages you with the brand nicely I think, but it’s not going to give you competitive advantage per se. So why follow this path? 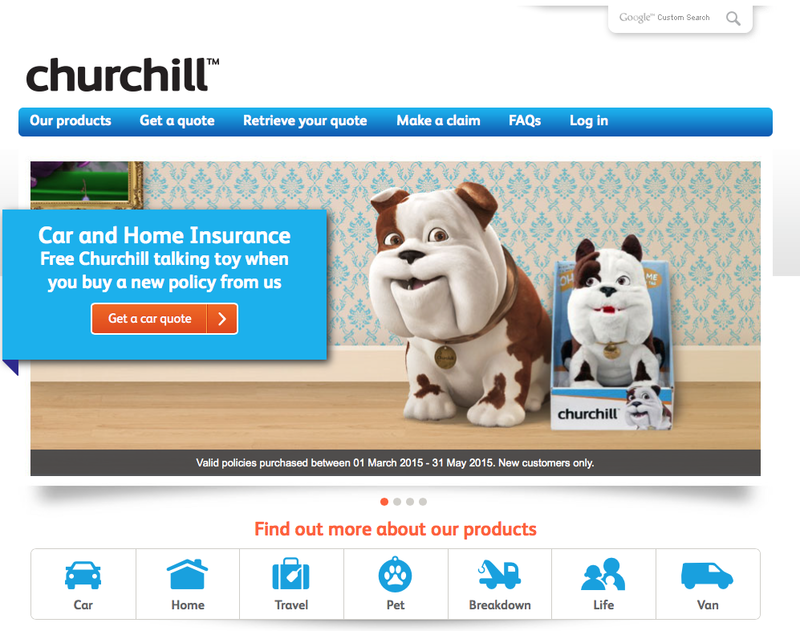 Churchill have been using the Dog since the company was formed, it is the Brand after all, and it is a natural step to bring it to life in consumers homes – as a character it has always had that ‘voice’. Like Confused.Com the Churchill You Tube Channel is worth clicking through to as it demonstrates very impressive engagement, and it’s funny too. This builds on their wry humour and as a natural step, does not feel forced in any way. For Confused it does feel a little forced and they may be relying on gimmickry and facilitating the advertising itself. Who knows if the idea was mooted initially? My sense is that offering the free robot straight away would have seemed a straightforward copy and it may have been less successful, building up demand is a nice ploy, one followed after all by Apple. That said, the You Tube Channel is looking very clever. 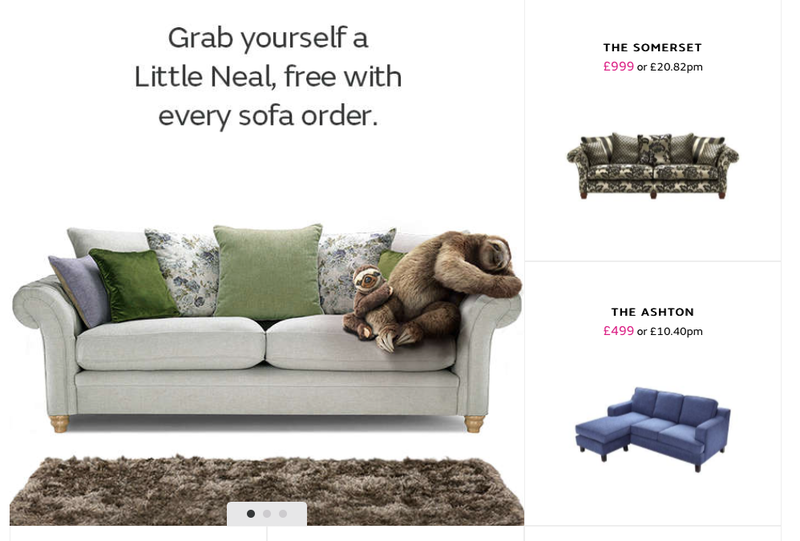 Neil is a just a great character, one I like, so I get that – I would imagine Sofa Works saw this as a campaign not a toy giveaway initially, but the great linking voiceover by Craig Cash perfectly embodies the character in speed of delivery … it really adds something. In short these brands are seeking to engage emotionally rather than rationally, in the fiercely competitive world of insurance where the rational price decision is the norm this makes a huge amount of sense, as a small increase in loyalty gives a clear financial benefit to the brand. A cautionary tale though – character based advertising can be dangerous .. remember Little Tiny Bill … I used to love this, I thought it had real legs … pun intended !! but it failed, maybe it was because you couldn’t easily create a character in real form, who knows? A cuddly Sainsbury’s Bank model .. maybe that is yet to come ! I think this is a type of offer that has some way to go yet, the success of the Meerkats is unrivalled and Compare the Market have proven the model for Brand engagement with it. Its natural to admire this and fast followers in the category, as I have highlighted here, will be successful. the chance of long term brand engagement has to be higher with this type of giveaway than with a cash offer or a voucher, those are too quickly realised in my view. How long it remains relevant for is anyone’s guess, but the Generation Game lasted 23 years over two runs, each of more than 10 years, so watch out for more conveyor belts and see if you can spot the Cuddly Toys ! Let me know if you spot any more cuddly toy giveaways, me? well I’m off to get a Parker Pen from a Life Assurer for the Over 50’s, I must be getting old ! !